One of the great things about the jewelry business is that every so often, we get to see and handle truly wonderful jewelry and gemstones. 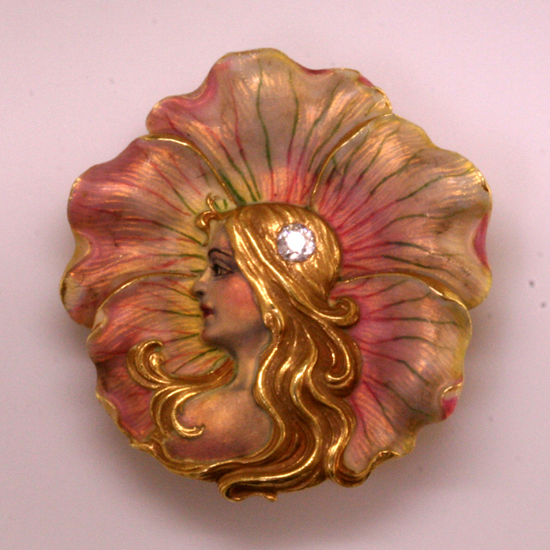 This classic Art Nouveau enameled brooch is exquisite– the sculpting of the woman’s face is delicate and lifelike while the swirls of her hair and the floral elements are beautifully expressive of the vitality of life. The delicate pink opalescent enamel, still in perfect condition after 100 years, is wonderfully shaded, and the face and flower petals are carefully accented by precise painted enamels. Around the turn of the century, watches were all the rage–everybody had one. 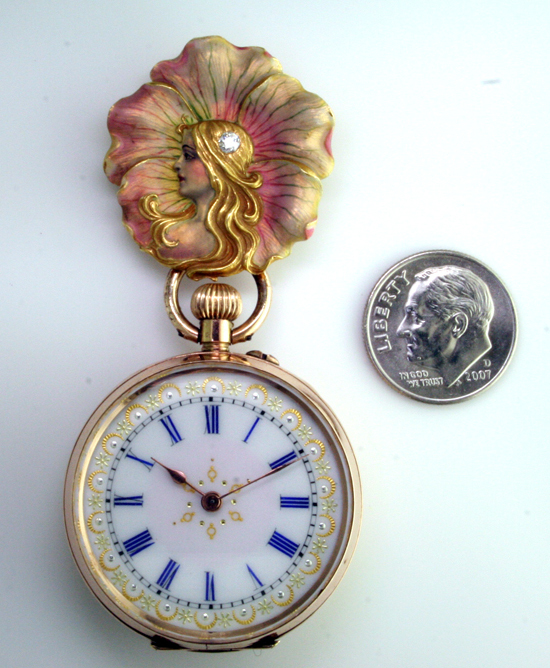 Since the wristwatch had not been developed yet, women’s watches were often worn as a piece of jewelry. 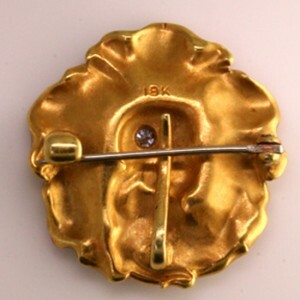 This brooch was specifically designed to carry a women’t pocket watch, as evidenced by it’s rather sturdy weight of 11 grams and the upward opening hook on the backside. Our Estate Department features wonderful treasures like this, precious survivors of bygone times. We buy, consign and sell estate jewelry, and offer expert consultation and appraisal services. This entry was posted on Wednesday, August 12th, 2009 at 10:45 am	and is filed under Estate Jewelry, Jewelry Services. You can follow any responses to this entry through the RSS 2.0 feed. Both comments and pings are currently closed.